Best of British Triumph charts the turbulent and rich history of one of the world’s best-known motorcycle manufacturers, with examinations of every significant bike that contributed to the Triumph story. That story takes us back more than 100 years, to the time when a couple of German immigrants settled in Coventry and began manufacturing bicycles. Fitting a motor to one of their bicycles was the obvious step once the internal combustion engine had become established, and so the first Triumph motorcycle puttered its way around the leafy lanes of Warwickshire in 1905. 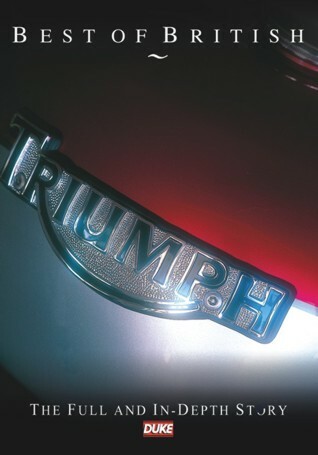 This DVD traces the history of the marque from that historic first bike, filmed in the National Motorcycle Museum, to the lauch of the 2009 Street Triple R. For a full seven decades, Triumph enjoyed success after success, then disaster struck as the original company collapsed-along with the rest of the British bike industry. However, during those first 70 years Triumph motorcycles had become among the best known with truly iconic models like the Speed Twin, the Tiger 100, the Thunderbird and the Bonneville. Such was the reputation, the Triumph name refused to die. Enthusiast Les Harris, under license from the brand name owners, kept the legend alive making small batches of Boneville twins in his little factory in Devon. In the 1980s, salvation arrived in the form of British businessman John Bloor, who combined his capital with goodwill Triumph still enjoyed, to resurrect the marque. Thanks to good designers, managers and enthusiastic production workers, Triumph is back on the world stage, competing against rivals from Japan, Germany and the USA.